Cuckoo Clock with quartz movement (battery operated). 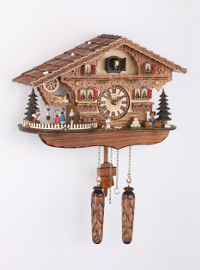 These quartz movement cuckoo clocks combine the traditional wooden cuckoo clock with a battery-operated quartz movement. The clock doesn't have to be re-wound every day or every week. The cones / weights on these clocks are only decoration; the pendulum swings with the ticking of the clock. The cuckoo call is controlled by a light sensor on the clock front. At the night the clock automatically turns to silent mode and the cuckoo is silent. At the full hour the cuckoo calls, the cuckoo door opens and the bird comes out, flapping his wings. The clock plays a tune. The clocks plays 12 tunes alternatingly. The clock is completely made of wood, hand-made in the Black Forest. made by Trenkle Uhren Clock Factory, Black Forest.